A Timber Wolf, more commonly known as a Gray Wolf, looks directly at the camera in Parc Omega, located in Montebello, Outaouais, in Quebec, Canada. This species of wolf is the largest member of the Canidae family, which includes coyotes, jackals, wolves. Scientists think that this species dates all the way back to the Late Pleistocene era; about 300,000 years ago, meaning that it would also be a species that survived the Ice Age. The Timber Wolf, aka Canis Lupus, is an animal which used to be really abundant over Eurasia and North America, however due to destruction of their habitat by humans, and interaction between humans and the wolves, they are now endangered, however, are not classified as such. They are protected in some areas, but due to their history with humans and their affinity to carry disease, most areas have not raised enough concern to consider them endangered, and if they don't soon, it might be too late to save the species as a whole. 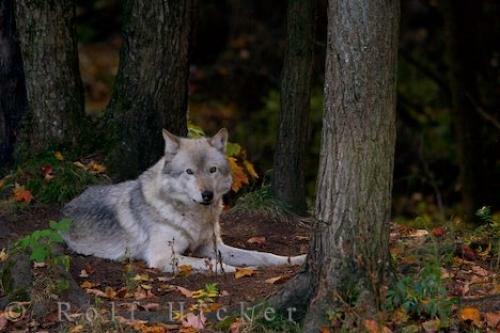 Photo of a Timber Wolf, so known as a Gray Wolf, at Parc Omega in Montebello, Outaouais, Quebec, Canada. ... They also can carry rabies as they can catch it from other species. If one of these wolves does catch the disease, they can become extremely violent and can attack humans if approached. A rabid wolf bite can be treated, but sometimes they can still kill if the person is not vaccinated in time. These factors and a history of being a nuisance to farmers and even people living in towns, has given these wolves very little protection from human harm. I photographed this photo with the digital SLR camera model Canon EOS-1Ds Mark II, aperture of f/6.3, exposure time of 1/125 sec. on ISO 400, as always I used a original Canon Lens, the focus lenght for this picture was 330mm.